The Personal Responsibility and Work Opportunities Reconciliation Act of 1996 (PRWORA), the landmark legislation that radically reformed the welfare system, has been in a state of legislative limbo since 2002, when the law expired. Congress has been unable to agree on reauthorizing legislation. Instead, the program has been temporarily extended several times. This lack of action hinders states and localities in their long-range planning because of uncertainty regarding funding levels and program changes that may be mandated. Congress must reauthorize PRWORA now so that the progress of welfare reform may be advanced. 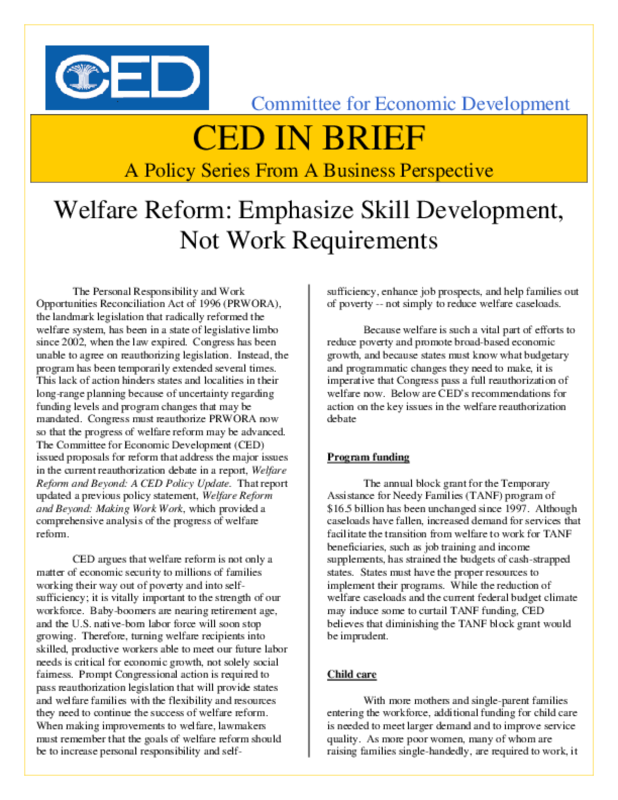 The Committee for Economic Development (CED) issued proposals for reform that address the major issues in the current reauthorization debate in a report, Welfare Reform and Beyond: A CED Policy Update. That report updated a previous policy statement, Welfare Reform and Beyond: Making Work Work, which provided a comprehensive analysis of the progress of welfare reform. CED argues that welfare reform is not only a matter of economic security to millions of families working their way out of poverty and into self sufficiency; it is vitally important to the strength of our workforce. Baby-boomers are nearing retirement age, and the U.S. native-born labor force will soon stop growing. Therefore, turning welfare recipients into skilled, productive workers able to meet our future labor needs is critical for economic growth, not solely social fairness. Prompt Congressional action is required to pass reauthorization legislation that will provide states and welfare families with the flexibility and resources they need to continue the success of welfare reform. When making improvements to welfare, lawmakers must remember that the goals of welfare reform should be to increase personal responsibility and selfsufficiency, enhance job prospects, and help families out of poverty -- not simply to reduce welfare caseloads. Because welfare is such a vital part of efforts to reduce poverty and promote broad-based economic growth, and because states must know what budgetary and programmatic changes they need to make, it is imperative that Congress pass a full reauthorization of welfare now. Below are CED's recommendations for action on the key issues in the welfare reauthorization debate.